It’s a sad fact that as we grow older, our bodies stop functioning quite as efficiently, which can lead to numerous health defects. Rarely is this more keenly felt, however, than in your teeth – happily, modern devices like dentures can help offset some of the worst issues. However, prevention is always preferable, so we’ve compiled some of the most common dental dangers for our older population. It’s well known (and feared!) that the onset of old age brings on a whole host of health issues. Fortunately, we have more medications than ever to help us combat these issues. Unfortunately, they can lead to complications in themselves. One of the most common side effects of modern medication is dry mouth. Dry mouths leave us with less saliva, which can have serious consequences for good dental health. Saliva contains natural antibacterial and acid neutralising properties that are hugely beneficial for our teeth, so reduced amounts of it leave them weaker and more prone to decay. The good news is that it’s fairly easy for dental professionals to treat, as long as it’s spotted and reported early. Ways that you can avoid dry mouth yourself include drinking more water, avoiding coffee and alcohol (and other similarly dehydrating beverages) and chewing sugar-free gum or lozenges, which stimulate saliva production. 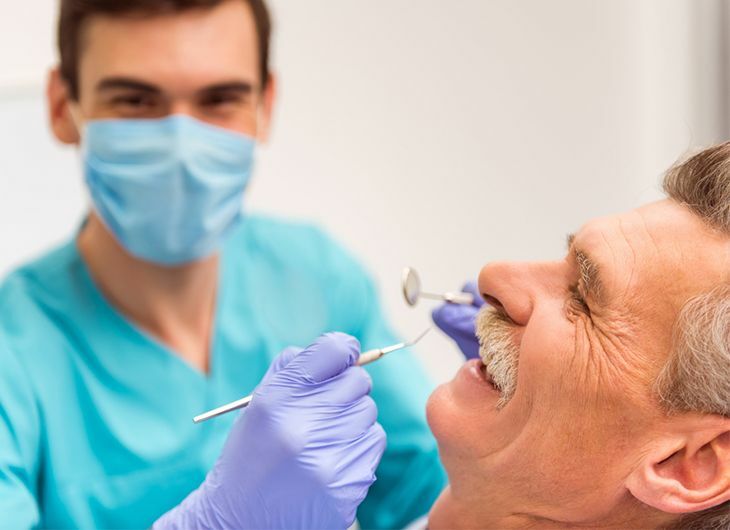 Due to advances in good oral preventative medicine, as well as gradually changing attitudes, more and more people are finding their way into old age with their natural teeth still intact. However, once they get there, they face a whole raft of new threats to their oral health, many as a result of their environment. One of the most keenly felt effects of getting older is a loss of mobility, which can have a serious knock-on effect to dental health. For example, arthritis can make it difficult to hold and properly use a toothbrush, and many residents in care homes lack the ability to get themselves up and to the bathroom to do so in the first place. This often leaves the onus on sometimes overworked nurses, which in turn can lead to unintentional neglects in the oral health of their residents. Many care homes also use sweet diets for their residents, which can obviously similarly damage their oral health. What’s more, poor oral hygiene could have even more serious consequences for the elderly – even death in the case of developing mouth cancers. Some doctors have suggested that this can be combated by nursing homes being set up with a dedicated dental provider, who can supply them with frequent expert opinions about the oral health of their residents. However, there’s no word yet on what sort of money these sorts of schemes will require, nor where the homes would get the resources to fund them. Dedicated dental practitioners for care homes might seem like pie-in-the-sky thinking right now, but in the meantime there are plenty of ways you can ensure you or your loved ones continue to have healthy teeth and gums. Make sure that they’re seeing the dentist twice a year, and bring with you all details of existing health conditions – you might be surprised at how much is relevant! Professional dental help like ours can screen for early signs of oral cancer, check your teeth for decay and gum disease, and assess the likelihood of such situations developing. In the case of the latter, we’ll always try and recommend any active courses of action to pursue, so that you can take a proactive stance on the oral health of the patient concerned. We’ll also make sure that any dentures aren’t ill-fitting or painful, and evaluate the effectiveness of any measures currently being taken. You can have a look at our range of dentures, proven many times over in their effectiveness, or contact us for friendly, professional advice – and remember we have an emergency service for when you just can’t wait!